One aspect of home renovation planning that can often be a source of stress and confusion is the budget. It’s fun to research materials, brainstorm ideas, and consider creative details such as colour, texture, and the overall theme. But when it comes to the budget, research can be much less fun and much more overwhelming. There are so many categories and subcategories to be accounted for, and once things are underway the numbers have to be constantly revised. To help solidify your budget ideas and start to get organized, here are some key points to consider. Create a spreadsheet of all items arranged by the type of expenses. Then divide the items into three columns: the planned amount, adjusted amount, and the actual amount. The planned amount is an initial estimate of how much a task or item is likely to cost. As further research is gathered, you will have a more refined calculation of the projected cost, which is the adjusted amount. Finally, when the item is purchased or the task paid for, the column marked actual amount would be filled in. It is important to update and edit your budget as the project progresses. Keeping track of the initial projections, interim estimates, and final expenses ensures that you won’t let your original plan fade to memory while staying realistic with the current state of the project. Every project needs a healthy contingency fund. This should be calculated to cover last-minute changes to the work performed, unforeseen logistical problems or any other reconsideration — ten percent of your total budget is a good estimate. Also to be included in the contingency fund is a buffer, in case of weather-related or other delays in construction time, for which another ten percent of the total budget should be set aside. The total contingency fund should equal twenty percent of your total budget. It’s important to keep the lines of communication open between you and your project manager. Provide a link to your budget document to stakeholders in the project who may need to edit the document as updates become available. This helps you get on the same page and any avoid any misunderstandings. Often during renovations, emails get overlooked or missed, so it’s important to establish the best communication method upfront. Opportunities to save money can come from many unexpected places. A few small choices along the way can add up to great savings. For example, wallpaper could be replaced with a simple paint job, or concrete slabs used instead of pavers. 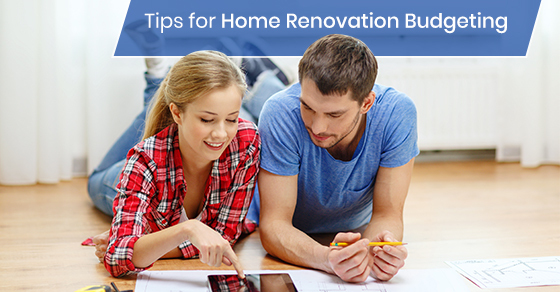 You wouldn’t want to change the parts of the renovation that are vital to your vision, but certain details can be easily adjusted to decrease overall expenses. Sometimes the impression we get from glossy magazines and television is that custom finishes are the only way to achieve a unique, creative touch in our own renovations. Yet blending custom finishes with stock finishes is a clever and convenient way to stay on budget. A few bespoke elements tailored to complement and contrast beautifully with the overall look of your home will create the individual vision you seek. Keep in mind that custom made items will add lead time at all stages, including manufacturing, shipping, and installation. Extra expenses often tend to get compounded, for example, when manufacturing delays necessitate expedited shipping, and then the delay in receiving the item causes delays in the installation that item and any other items waiting in the installation queue, and so on. Be sure to include a generous buffer in your timelines for all custom finishes. During the planning stages of a renovation, taxes and shipping expenses are often overlooked. It’s common to copy-paste prices directly from the website of a supplier into an expense spreadsheet, but doing so can overlook additional costs. Also consider hidden costs such as handling and importation/customs fees, which may not be immediately obvious on a supplier’s website. Over the contingency fund, which covers miscellaneous and unforeseen but predictable expenses, set aside five percent of your total budget for outright mistakes. This amount will be there to cover errors such as scheduling mistakes, underestimation of material expenses, underestimation of man-hours spent on laborious or delicate tasks, breakages, and delays due to a subcontractor. No matter how much preparation and research you do, your renovation is likely to include unanticipated costs. It’s important to reserve five percent of the total budget for mistake-related expenses. For more information on budgeting for your home renovation, please call Avonlea Kitchen and Bathroom Concepts at (416) 907-7891 or contact us here.